Good morning and happy saturday! I had a great time at the royal wedding yesterday, it was a long day so I’m pretty tired and jetlagged today……OK, I am such a dork. I clearly didn’t go 😛 Nor did I even watch any tv coverage. I was too upset that my invitation was lost in the mail. My only interest was in what people wore. Did anyone else think Pippa Middleton stole the show? Anywho, enough of my lame attempts at humor. It’s saturday morning and my brain is already mush. Not a good sign. I woke up super early to proctor an exam (I guess this would be worse if I had to write the exam, but I don’t really care I’m going to complain anyways 😛 ). I figured that if I had a nice little breakfast ready for me when I awoke, I would be less of a grouch. I also thought if I could prepare my breakfast ahead of time, I could sleep for a few extra minutes (also making me less of a grouch). For more about Overnight Oats. 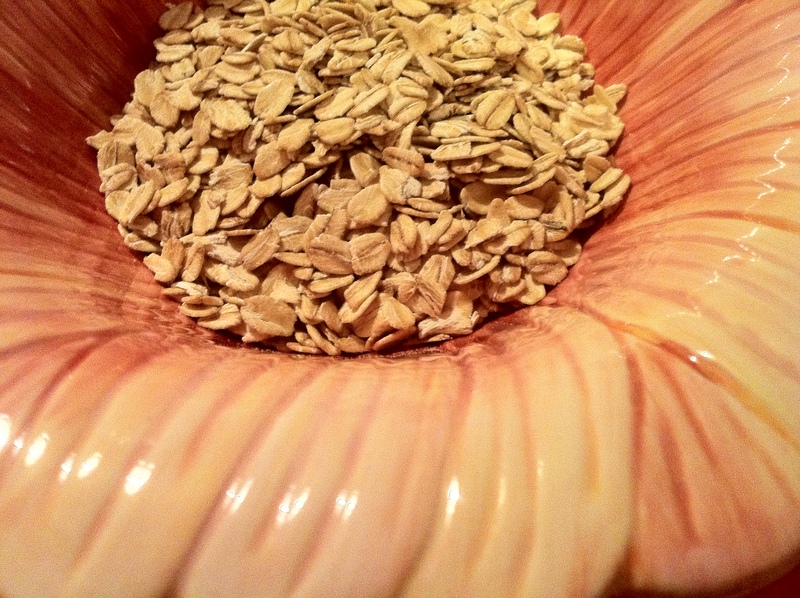 Head over to Kath’s Page…she’s got a whole section dedicated to oats! 1/2 cup oats, 1/2 cup milk, 1/4 cup greek yogurt, 1/2 a banana, and because I had to proctor an early exam I spiked my oats with some Godiva hot cocoa powder. This morning I stirred in some peanut butter to complement the chocolate. To be honest I was a little nervous, it really doesn’t look the most appetizing. I actually kept trying to coax Mr PinkGiggles to have the first bite, but he wouldn’t fall for that. The verdict? I love that I can prepare something quick the night before and have a tasty and filling breakfast waiting for me. I am always running around in the morning like a headless chicken, so taking the 0.25 seconds the stir this together before bed is a major plus. However, I felt like the banana taste was too strong. 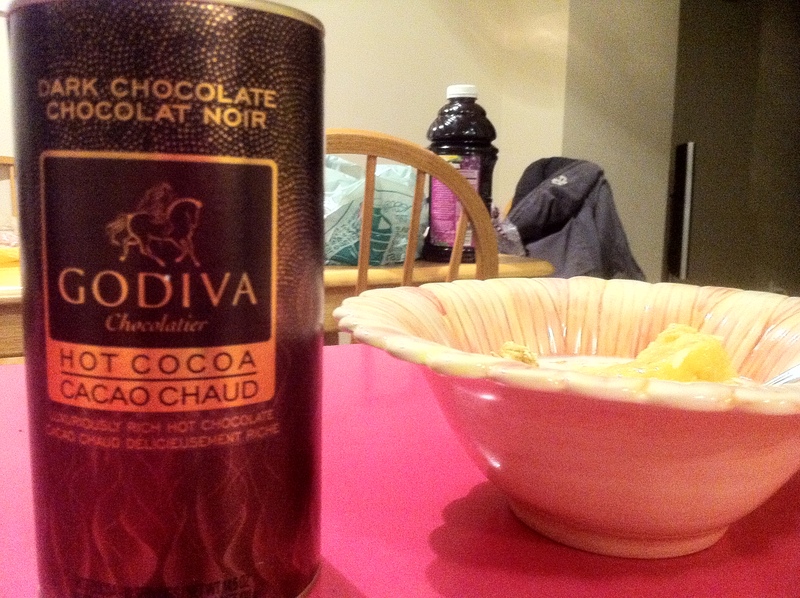 I am not sure if it was because I did not add enough Godiva, or if I should just add cocoa powder instead of hot cocoa mix. I added some fresh strawberries to my bowl which helped control that banana and it was divine. This is definitely something I will be having for breakfast again, but I would like to experiment with different mix ins. Maybe I can even omit the banana all together. I shant write anymore, because clearly my mushy brain is not functioning….Maybe I can take a quick nap in my office…. Cross your fingers no one sees me! Let’s chat! What is your favourite breakfast? My favourite breakfast is, strangely enough, the weird and random foods you throw together after a crazy fun night with your friends and they’ve spent the night. It’s not very healthy but it’s usually very interesting. Otherwise, I love cereal. Kashi GO Lean Crunch mixed with some Cinnamon Toast Crunch because I’m still a little kid at heart. That floral bowl is outright gorgeous! Love it! And yes, Pippa definitely stole the show. I wonder why she wore a white dress – I kind of would love to know if it’s tradition, or just Kate’s preference or what! My favorite breakfast is a tie between overnight oats and cereal combos 🙂 And I too was a little disappointed that my Royal invite got lost in the mail. I was up at 5 AM watching everything and Kate was breathtaking! I’ve heard talk about Pippa stealing the show – but I think that’s crazy! She’s very pretty with a killllller figure, but Kate is simply stunning! What does overnight oats mean? You just prepare it the night before?!?! I want to try them! !